Former HD Spiker Mela Tunay is suiting up for the Tri Activ Spikers this conference. 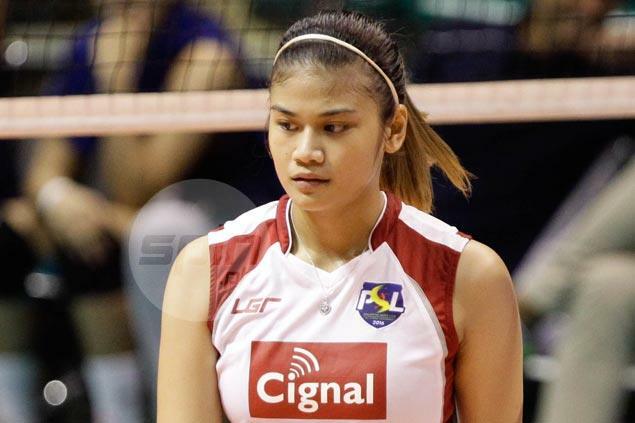 FORMER University of Santo Tomas spiker Mela Tunay has formally joined Petron, signing a contract for the Philippine Super Liga Invitational in February. Tunay first attended UST practice in December and was included in a list of players announced by Petron as new acquisitions a few days ago. Tunay, her manager Charlie Dy and SMC sports director Alfrancis Chua signed the contract on Wednesday at the San Miguel Corp. headquarters in Ortigas. Details of the contract were not revealed but Tunay signed for only the month-long Invitational Conference to be able to still take hosting and modeling jobs. “Volleyball is my passion, it is my first love,” said Tunay. “Kaya noong nagkaroon ako ng opportunity to play again, hindi na ako nagdalawang isip and I immediately grabbed it,” she added. UST’s Sisi Rondina and Ria Meneses have also been acquired by Petron but are set to play in the UAAP and will be able to suit up for the Tri Activ Spikers in the PSL All Filipino in June. Former Tigresses Aiza Maizo-Pontillas and Rhea , and former F2 Logistics player Mika Reyes are also set to suit up for Petron, joining holdovers Mayette Zapanta, April Ross Hingpit, Frances Molina, Bang Pineda and Mina Aganon. “Being with them sa Petron feels like coming home for me,” said Tunay.